WACKER BIOSOLUTIONS has undergone an exemplary process of transformation. What is the new core business? Gerhard Schmid: In 2010, we restructured completely, clearly focusing our organization on the market. Today, we concentrate on our customers’ needs in the core markets of food and pharmaceuticals. We have been very successful in this in recent years. Since we restructured the division, we have increased sales from €100 million to over €220 million. Biologics are considered a growth market. Gerhard Schmid: There is a major shift in the pharmaceuticals market toward bioengineered medicines. Where chemical molecules were used in the past, medical professionals now rely on biologics. As a biologist, I think these new treatments are marvelous. Our own body cells can be reprogrammed to specifically attack a tumor, for example. Another incredibly fascinating approach is the use of gene therapy to treat epilepsy or Alzheimer’s. What role does WACKER BIOSOLUTIONS play here? Gerhard Schmid: We are well-positioned as a service provider for these novel treatments and now also have the capacity to take on new customers. Our production line in Amsterdam, which we acquired in 2018, is doubling our capacity. Amsterdam is a good example. WACKER BIOSOLUTIONS manufactures live bacteria there, as vaccines among other things. What is this all about? Gerhard Schmid: Live bacteria that are used as vaccines, for example against cholera, must be produced under sterile conditions – that is without bacterial or viral contamination. This requires special techniques that only very few manufacturers possess and thus puts us in somewhat of a unique position. 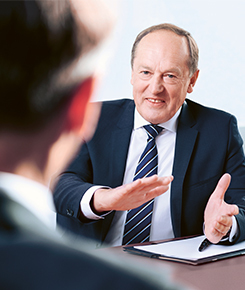 Dr. Gerhard Schmid (64) has headed the WACKER BIOSOLUTIONS division since 2003. He has been at WACKER since 1997. Gerhard Schmid: We do not want to be a pharmaceutical company. As a contract manufacturer, we offer comprehensive service – and are growing more strongly than the market. We are developing cell lines for new pharmaceutical proteins, for example for cancer treatments. Our technologies have an excellent reputation and help produce these proteins more cost-efficiently. We have no desire to develop and sell pharmaceutical products ourselves. What are your main areas of focus in the food sector? Gerhard Schmid: The food market is an important pillar for us. It is stable, expansive and heterogeneous – and is growing considerably in certain areas. As the world’s biggest producer of gumbase for chewing gum, we have been an active player in this sector for decades. As well as this, we have pursued the healthy-eating megatrend in recent years. How exactly does WACKER contribute to healthy eating? Gerhard Schmid: We are, for example, very successful in marketing a cyclodextrin-encapsulated curcumin product that we developed ourselves. It has been proven that curcumin, an extract from turmeric, has a strong anti-inflammatory effect. Our product CAVACURMIN® is characterized by its particularly high bioavailability – the human body can absorb forty times more curcumin from this product than it would otherwise. Cysteine is also used in the food sector. It had previously been obtained from feathers, human hair or pig bristles. WACKER has developed a new process. 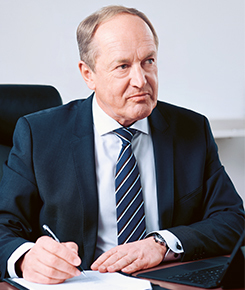 Gerhard Schmid: We are the first company to succeed in producing cysteine by fermentation. It is vegetarian-grade and, at the same time, eliminates the need for large quantities of hydrochloric acid. That’s why we won an environmental award for our process. At our new site in León in northern Spain, we now have a fermentation plant where we can manufacture cystine, which is converted into cysteine via electrolysis. Cysteine is not only used in the food sector. It is also an important raw material in the pharmaceutical industry for manufacturing expectorants and biopharmaceuticals. WACKER BIOSOLUTIONS is highly innovative when it comes to cyclodextrins as well. Your scientists frequently develop new applications here. What are the most promising ones? Gerhard Schmid: We are the only manufacturer able to produce all three forms of this natural degradation product of starch on an industrial scale. The lion’s share of our production takes the form of beta-cyclodextrin for room sprays that neutralize odors. We are continually finding new applications for alpha- and gamma-cyclodextrins They are magical molecules! You can mix vegetable oil with cyclodextrin, for example, to obtain an egg-free vegetarian mayonnaise. You can also whip cyclodextrin up with honey to make a mousse. What’s more, it can mask bitter tastes. Where do you see the business division in five to ten years? Gerhard Schmid: Growth will continue. We expect rates in the double-digit percentage range. The investments and acquisitions of the past months present a huge opportunity, because we can now show that we are a chemical company capable of operating a large part of our business on a biotechnological basis with renewable raw materials over the long term.